A frozen banana is good for everything except thawing and eating plain. 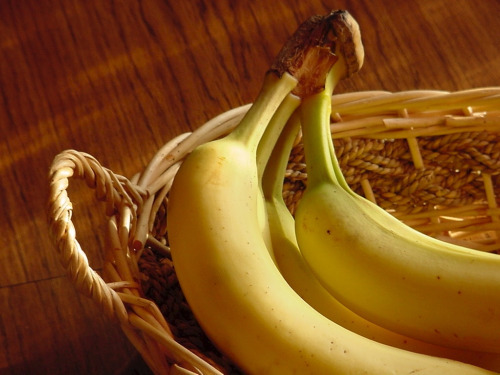 And freezing bananas is the perfect way to store extras that are getting too ripe. I literally throw them in the freezer as is, peel and all when I notice they are getting too brown. The peel, which turns black, actually prevents freezer burn on the fruit and I don't have to wrap or bag them. You could peel, slice, dice or puree them and store in a freezer bag if you want. We should freeze stuff with the end use in mind; since I usually have no idea what I'll make out of them I cut or puree as needed after they're fully frozen. A serrated knife, like a bread knife cuts through a frozen banana like butter. If I need chunks or puree I cut it in fourths from top to bottom and then cut those pieces in half so the flesh is the flat edge. Grab a spoon and press down in the middle of that flat edge and the frozen banana chunks pop right out of their peel. You can thaw before or after you cut them. On the countertop, in a bowl or on a plate, it'll take about 2 hours. In the microwave it usually takes 1-2 minutes. Tip: Slice the tips off and place bananas in a measuring cup to thaw, once thawed you can smoosh the fruit out of the peel into the cup. What to Make With a Frozen Bananas? Bread is the classic answer of course. Smoothies are a great choice too. When you use frozen fruit you don't have to use ice and your smoothie doesn't get watered down. 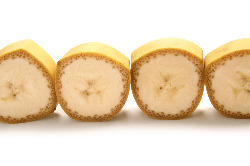 Cut a banana in half and insert a popsicle stick about half way through the fruit. This is easier to do before you peel the skin off. Place in the freezer on a parchment lined cookie sheet for an hour or two. Melt 2 cups of chocolate chips (milk, dark, semi-sweet, whatever you want). Dip a frozen banana, or use a spatula to cover it, in melted chocolate. Sprinkle with nuts, sprinkles or anything else you like. This works best with very ripe bananas where the skin is turning brown but the fruit is still white. If it isn't rip enough the 'ice cream' is bitter. Cut fruit into chucks and freeze. Put the chunks of banana into the food processor and puree until it looks smooth as silk, stir as necessary. Uneaten 'ice cream' is still a good puree for bread, smoothies and other recipes. Return from Frozen Banana Recipes to the homepage of your freezer cooking guide.